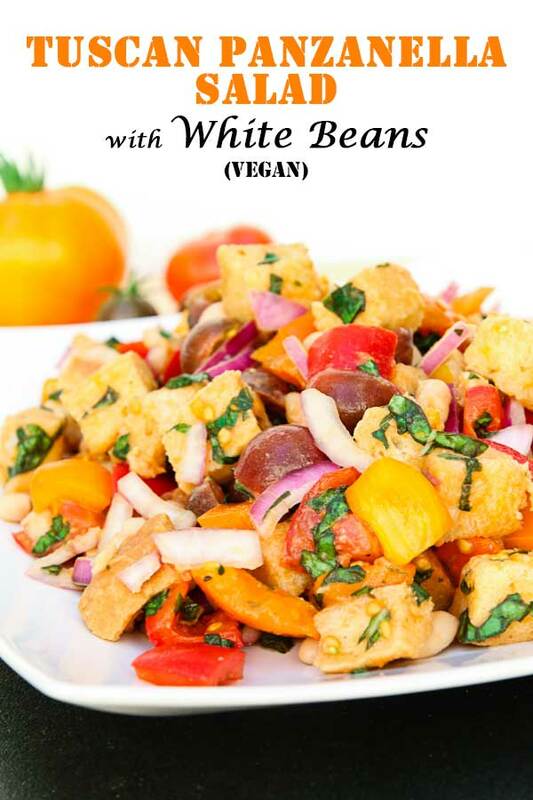 Take things up a notch and turn a traditional Tuscan Panzanella Salad into a complete meal by adding white beans! It’s easy, 15 minutes to prep, and delicious! Panzanella is a traditional Tuscan recipe that was created to use up stale bread. It’s a hearty, filling and delicious meal made with simple and fresh flavors that soak up into the bread and taste incredible. I took a stab at developing this recipe years after having it at one of our favorite local Italian restaurants during tomato season. I’ve had Panzanella a few times before, but unless it’s made right with proper textures and seasoning, it ends up being a big soggy mess…and let’s face it, no one wants to eat a plate full of soggy bread. 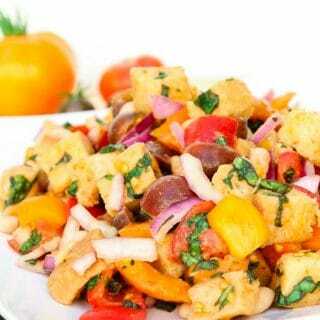 So here’s my take on a simple yet delicious, filling bread salad, Tuscan Panzanella with White Beans! It’s no secret that my favorite harvesting season is TOMATO SEASON. I’m talking about a ton of fresh tomatoes growing in our yard. Red Vine Tomatoes and Red Cherry Tomatoes are typically what we’ve grown the past 2-3 years, but this year, my brother grew a bunch of different plants from the seeds in his garage and gave us a few different types of Heirloom Tomatoes and Chocolate Cherry Tomatoes. There were all sorts of different colored beautiful heirloom tomatoes…HUGE…and so many of them! 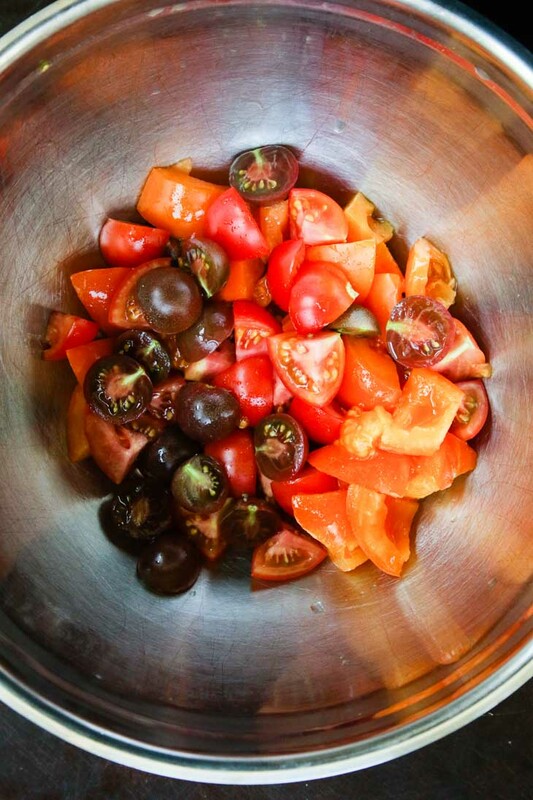 Quite honestly the best way to eat a home-grown tomato is raw which is why they are perfect for this panzanella salad! When you have loads of home-grown tomatoes, as much as I love enjoying them on my morning toast or sliced raw as a side, it’s impossible to go through so many at a time, and honestly, I can’t stop myself from creating with them in the kitchen. In past tomato seasons, I created my Tomato Sev Curry, Spicy Tomato Sauce, and my Creamy Italian Tomato Soup (that I have yet to veganize). This year, I decided to stick with my favorite way to enjoy home-grown tomatoes and created my take on a raw tomato bread salad, otherwise known as Panzanella Salad. Although I highly recommend using heirloom tomatoes for this salad, it’ll taste great with any assortment you can get your hands on. You can easily prepare this meal ahead of time or take it to a potluck or summer picnic, just be sure to add in the baked bread pieces just prior to serving. When I create salads, I like to turn them into complete meals instead of sides, meaning they not only need to be flavorful, satisfying, and delicious so that I’m not craving something after but also filling and healthy! I’ve been trying to incorporate white beans into my meals since they’re a great source of protein and calcium. They worked much better than chickpeas in this dish because of their texture and flavor. This salad comes together in 15 minutes, most of which is waiting for the pieces of bread to slightly bake in the oven to get that perfect texture for a bread salad. They are slightly toasted but soft enough to absorbs all the other flavors of the salad without getting soggy. Simply chop an assortment of tomatoes, add in a few other fresh ingredients, white beans, and a simple dressing, toss, and let it marinate in the fridge while you’re waiting for the bread to toast and cool. 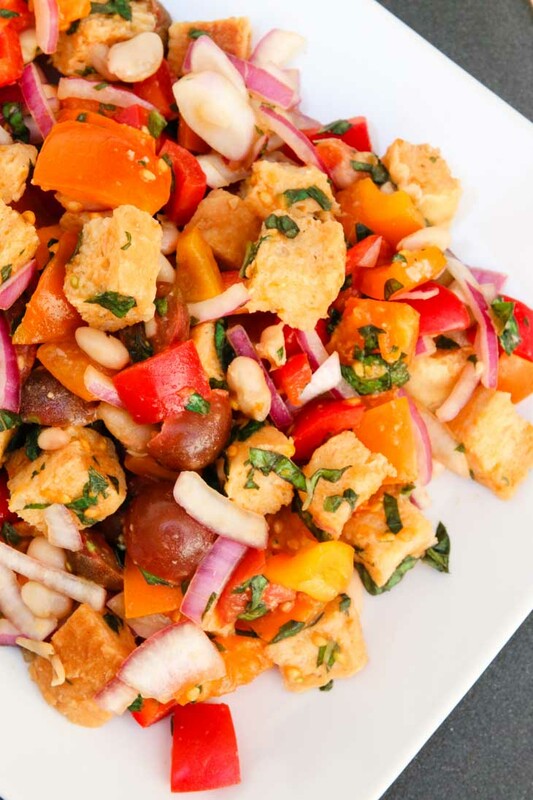 Toss with the bread prior to serving and you have yourself a delicious mouthwatering Italian dish, perfect for the summer, Tuscan Panzanella Salad with White Beans! I’ve even enjoyed (with the bread mixed in) the following day, and although the bread loses some of its texture, it’s still delicious (my husband took it to work the following day and still loved it). Get your hands on some delicious tomatoes before the season ends and try your hand at making this EASY Tuscan Panzanella with White Beans! Be sure to tag me on Facebook or Instagram if you try it out, with both @vegetariangastronomy, #vegetariangastronomy and let me know how you got on in the comments below. I’ve loved seeing and sharing all your re-makes! 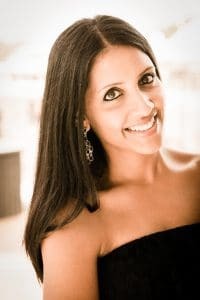 Thanks Reshana! Tomatoes are the one thing I always look forward to from our garden every year! You guys should definitely try these out with your sisters home-grown tomatoes! Perfect for tomato season!! Our baby tomato plant actually produced some wonderful little roma tomatoes!! So excited to be eating FRESH tomatoes this year! Yes...it's a total game changer!! There's really nothing like it and this recipe showcases raw tomatoes! That's awesome you have wonderful roma tomatoes! I love this dish a true and wonderful rustic Italian dish, my idea of perfection... Like you say all you gotta do is get the bread right and you are well away. Yes...the bread is the key! And really fresh produce since most of the flavors comes from all the tomatoes which is one of my favorite parts about this salad. Thanks Brian! I've never tried this kind of salad before but I am intrigued! Gorgeous heirloom tomatoes too! Oh you'll LOVE it! And the addition of the beans makes it filling, healthy, and delicious! Super easy to throw together, but works the best with market fresh or home-grown tomatoes since they are sweeter and juicier! Oh yum! Look at all the colours going on here! This looks like a great way to use up all the tomatoes we have growing in our garden. Yes! You'll love this salad...they showcase home-grown tomatoes well too! This looks awesome! My tomato plants didn't do great this year, but I'm holding out hope for next summer! Aww sorry to hear that! 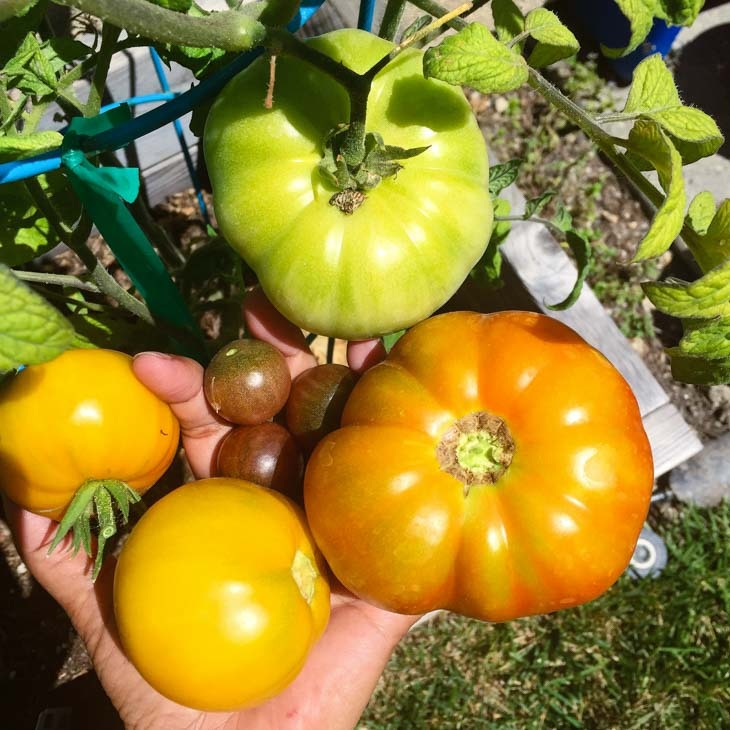 We also had so many more last year, but I think it's because we tried to grow heirloom tomatoes this year, which did great, but didn't end up fruiting as much. I love panzanella salad! I never had it with beans... great addition!! The white beans add the perfect flavor to them and it turns this salad into a filling healthy meal! 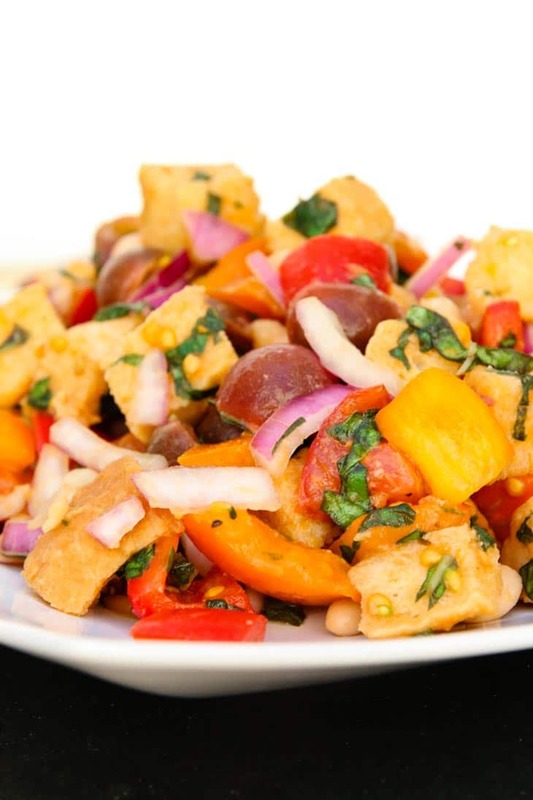 This is right up my street, I love Panzanella and this recipe looks so delicious. Beautiful photos too!! I've always loved it too, only had it twice! But once it wasn't made right, lacked a lot of flavor, and bread didn't go well. The beans is great because of the added protein! I love all the lovely tomatoes around at the moment and this is such a beautiful way to use them! Tomato season is the best. What a great summer salad! There's nothing like a home grown tomato. Thanks Kelly! Wow, you got a huge amount of tomatoes, amazing. I love how colorful this salad is, looks so delicious. Thanks Brandi! Yeah we did...not nearly as many as last year, but we tried heirloom this time and they were so good! I am waiting for my heirloom tomatoes to ripen, so i can harvest them. This has been a good tomato year so far and I am very happy. Such a great recipe to make the tomatoes shine! Yes! 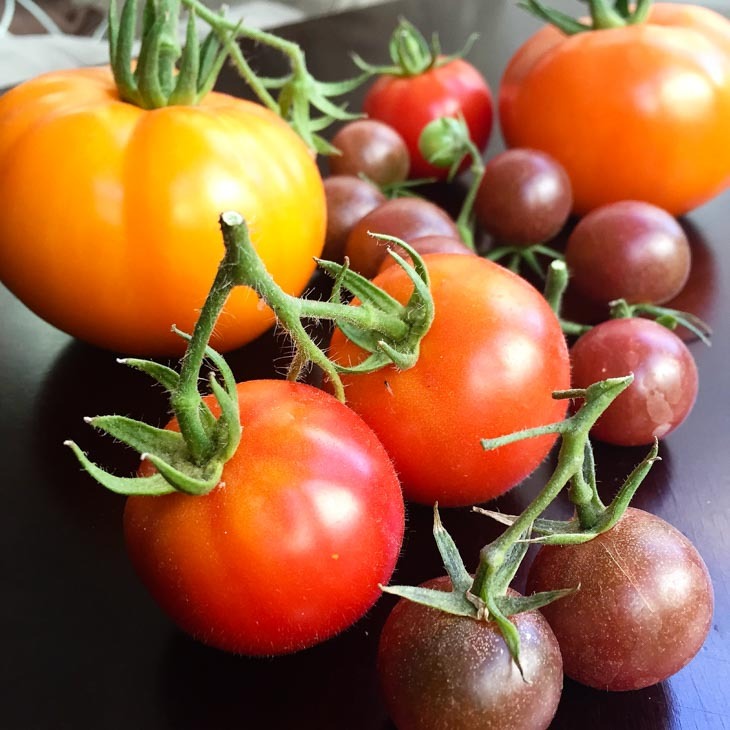 Heirloom tomatoes are awesome! 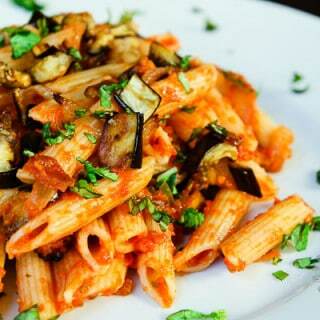 You definitely need to try this recipe...great way to keep the freshness of the tomatoes yet create a meal out of them! Yess, my friend's tomatoes are also about to ripen. Can't wait to try them :D Cool recipe by the way. Actually perfect for my meal plan at the moment! Fresh home-grown tomatoes are the best! 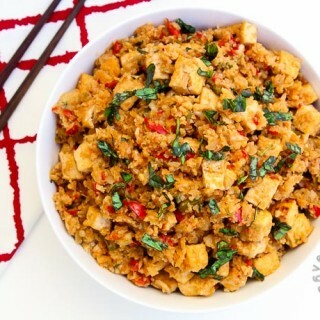 And this recipe is one of my favorite ways to use them! Let me know if you try it! I never heard about panzanella salad before. It looks absolutely delicious with all the colorful veggies! Thanks Michelle! It's a italian bread salad and amazing especially when you have fresh home-grown or heirloom tomatoes!